Many luxury vehicles offer a 360-degree view around your car on the dashboard which makes squeezing into tight parking spots much easier. Magellan now offers the same omnipotent vision to your junky ride with a new GPS nav unit that can connect to cameras mounted all around a vehicle. Given GPS navigation units now have to compete with smartphones and tablets that can also direct you where you need to go, Magellan’s new RoadMate 7670T-LM goes above and beyond with the addition of a built-in camera for capturing accidents, warnings for when you drift out of your lane or are following too closely, and a DVR to record any incidents on the road. What makes the new 7670T-LM worthy of consideration is that it can also help you see everything going on around your vehicle while you’re inside. It includes a pair of HD cameras that face forwards and back giving you a 340-degree view of what’s outside. 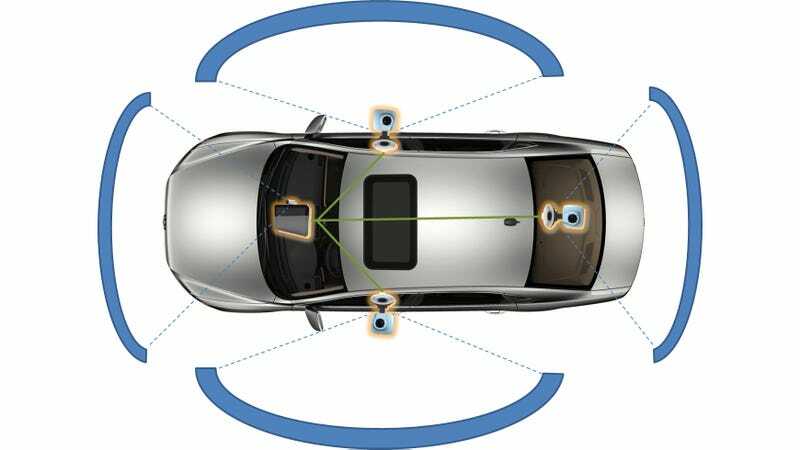 To get the full 360, you can expand the system with up to three additional external cameras looking out the sides and back of your car. At this point Magellan has only revealed that pricing for its new RoadMate DashCam Navigators starts at $180, which means the 7670T-LM will be considerably more expensive, especially when you factor in the cost of three additional wide-angle cameras. It’s pricey, sure, but when you consider a potentially skyrocketing insurance premium, making sure you don’t accidentally hit another parked vehicle starts to sound like a a feature worth investing in. Update: The 7670T-LM will sell for $230 when available, and additional cameras will be $75 each.